The retro look has been in style for a while now particularly fringes, and I anticipate them making their way well into fall. I was debating whether I wanted to try this trend on a bag, shoes or maybe on a dress. Well I watched a webinar with the darling and super stylish Hilary Rushford and she did her Dean Street Dance Break wearing a top with fringes so long and dense, it was love at first sight. 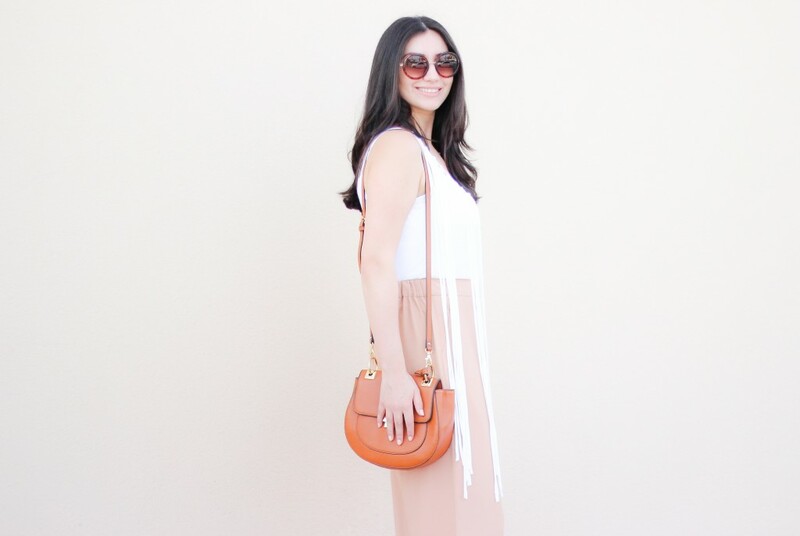 I wanted to try the look myself but wasn’t sure how I felt like styling it until I saw these wide leg pants. I thought to myself, if I’m doing a retro look then I might as well see it all the way through. I’d love to hear what you think of this look! You look so chic and fab! Love the fringe and wide leg pants. I’ve never been able to pull of the wide leg. You do it perfectly and this bag is gorgeous too!